The purported leader of La Linea criminal organization, "El Diego," was arrested Saturday. Mexico City (CNN) -- A suspected leader of the Juarez drug cartel told authorities he had ordered the deaths of about 1,500 people, a Mexican federal police official said Sunday. Federal police detailed accusations against Jose Antonio Acosta Hernandez, known as "El Diego," a day after authorities announced his capture. He was one of the country's most wanted criminals, with officials offering a reward of 15 million pesos ($1.3 million) for his arrest. Collaboration with the U.S. Drug Enforcement Administration led to Acosta's detention, said Eduardo Pequeno, head of the Mexican federal police anti-drug unit. Acosta is accused of being a leader of the drug gang known as La Linea, the enforcement arm of the Juarez cartel, Mexican authorities have said. Pequeno told reporters that Acosta "said he ordered the killings of about 1,500 people, mostly in Ciudad Juarez and Chihuahua's capital." 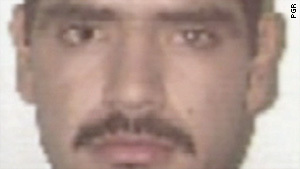 An investigation points to Acosta as the mastermind behind the March 2010 killing of three people connected with the U.S. Consulate in Juarez, Pequeno said. More recently, Acosta ordered operatives to hang banners with threatening messages directed at the DEA and other U.S. authorities, Pequeno said. Juarez, Mexico's most violent city, shares a border with El Paso, Texas. Pequeno also accused Acosta of having connections with some of the border city's most notorious violence over the past two years, including the 2010 killing of a state prosecutor, a car bombing outside a police station and a massacre at a house party that killed 15 people -- most of them students with no ties to organized crime. Acosta told authorities the targets of his criminal organization included police, government officials, rival drug gangs and civilians, Pequeno told reporters. Earlier this month, the U.S. consulate in Juarez issued a statement warning "American citizens to remain vigilant" based on information it had received that cartels may target the consulate or entry points on the U.S.-Mexico border. The northwestern Mexican state of Chihuahua, which contains the namesake capital city as well as Juarez, has been a hotbed for drug-related violence. The federal government has been targeting cartels' operations, and especially its leaders, in an ongoing battle. Mexican authorities have arrested several others they accuse of being connected to the slayings of three people connected with the consulate last year. The shootings occurred March 13, 2010, when consulate employee Lesley Enriquez and her husband, Arthur Redelfs, were gunned down as they left a birthday party in their white SUV. Jorge Alberto Salcido Ceniceros, the husband of another consulate employee, was killed in a separate vehicle.